The Health Assisting Occupations program offers a flexible, four year curriculum designed to benefit students interested in careers in health and related fields. Field trips to local heath care facilities and providers, as well as presentations by industry professionals, enhances lab and classroom learning. Program graduates can seek immediate employment, choose post-graduate training, or earn an associate’s, bachelor’s, graduate or medical degree with this unique background of health sciences and advanced academic training. 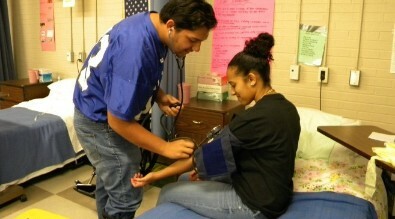 Health related careers are currently among one of the largest industries in the world. Topics include, infection control, legal responsibilities, and communication skills. The students will develop and educational plan to include academic courses supporting the Health Occupations curriculum. The Sophomore students focus on basic Anatomy and Physiology of the body systems. The students are introduced to medical terminology. Basic human growth and development curriculum is coordinated with a clinical placement in preschool through second grade classrooms. Students address and apply competencies such as obtaining heights and weights, vision, and hearing screenings. Students are also certified in CPR, AED and First Aid. The senior students continue studying the anatomy and physiology of the body system. Students assisted to find clinical placements in community based health care agencies or related occupations. Seniors also renew their CPR, AED, and First Aid.